Quiet, clean, safe, well-located and a good value. These are some of my top criteria when choosing a place to stay while traveling. On a recent trip I booked a variety of accommodations online so I could compare them and see what works best for me. My first stop upon arriving in Europe after a long flight from Seattle was at the mid-range Townhouse Design Hotel in Maastricht, Netherlands. The hotel has a minimalist-hip decor, complimentary use of a laptop, free in-room wi-fi, and a convenient location next to the train station. My room also included extras like a wall-mounted flat screen TV with British television, a queen-sized mattress, and a large bathtub, which I put to good use my first night as I arrived on a chilly early spring afternoon. For an average price of 112 Euros per night for a double, it was at the upper end of my budget, but the convenience of being a short 5 minute walk from the train station, and the extra amenities made for a great way to kick-off my 2 week trip to Europe. My next stop was at the Altes Winzer Haus, on the Moselle river in beautiful Cochem, Germany. This small, well-run inn is about 2km from the center of town, but easily reached by walking along the river promenade, or by bus or taxi from the train station. My room here was a little smaller and more basic than the design hotel I stayed at in Maastricht, but it provided everything I needed – a quiet and comfortable spot to rest my head. The hotel has guest rooms overlooking the Moselle, and the patio off the dining room is a peaceful place to sit and have a glass of wine at the end of the day. For just 60 Euro per night including a delicious breakfast buffet and taxes, it was an excellent value! For just one night in Koblenz, Germany, I chose the Hotel Kleiner Reisen. 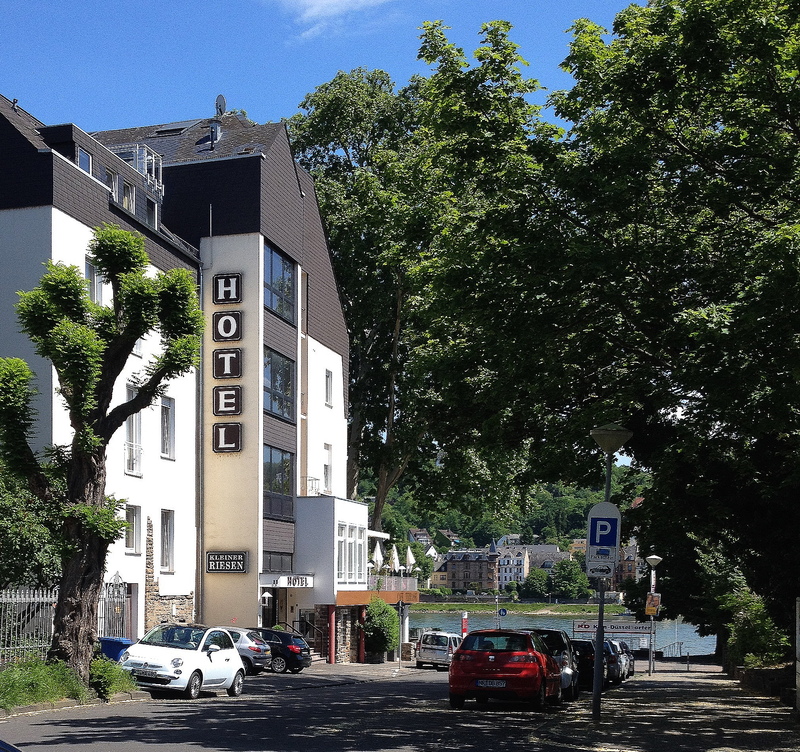 Located right on the Rhine promenade, my room had a great view of the river – and a massaging lounge chair, which was a real treat after all the walking I did in Cochem. The well-stocked breakfast buffet could be enjoyed in the elegant dining room, or on the outdoor deck overlooking the Rhine. I even had a mini-fridge in my room, so I was able to shop for a few basics at the nearby grocer. For just 69 Euros, including breakfast and taxes, it was an excellent value, and is in a perfect location in Koblenz to hop on a Rhine river cruise. My last stay in Germany was at the Ibis Hotel Centrum in Cologne. Ibis is a budget-friendly chain with locations all over the world, and it’s popular with business travelers. The hotel is in a quiet neighborhood about a 20 minute walk from the Hauptbahnhof, or a short ride on a nearby tram. My room was quiet, clean, non-smoking, and very comfortable. I even had a queen-sized bed and a peek-a-boo view of the cathedral from my window. There’s a lounge downstairs with computer terminals for guests to use, and a friendly staff. The total for my stay was 72 Euros per night, without breakfast. For a visit to Brussels, I chose a private room on Airbnb in a building close to Gare du Nord train station. My friendly host, Aida was welcoming and fun to chat with in the evenings after a day out. Her apartment was tastefully decorated and completely remodeled with upscale appliances and fixtures. Everything was very clean and well-maintained, to a level you would normally expect in a hotel. Aida also provides a shelf full of travel guidebooks and maps, and a list of tips on what to see, and the best places to eat and shop. Since the building is just around the corner from the train station, it was perfect for exploring Brussels, as well as taking day trips to Brugge and Ghent. For a 5-day stay the total came to 383 USD, and included linens, use of the kitchen and laundry facilities, and a nice glass of Palm beer to welcome me to Brussels. By the time I left, I felt as though I had stayed with friends.